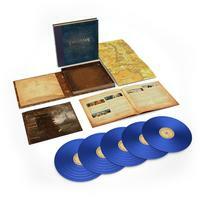 The Lord Of The Rings: The Two Towers - The Complete Recordings on vinyl for the first time as a 5LP boxed set. Housed in a collector's box with a blue leather-style spine, the collection is limited to 8,000 individually numbered copies on blue vinyl. "When it opened in theaters, The Lord of the Rings: The Two Towers ran one minute short of three hours; the subsequent DVD version added another 44 minutes. An even greater increase is seen here. The single-disc soundtrack album that was released initially crossed the 70-minute threshold, but this expansion, following a similar one for the first installment in the trilogy, The Lord of the Rings: The Fellowship of the Ring, adds much more material. 01 "Where Is The Horse And The Rider?" Everyone knows how wonderful the Lord of the Rings scores are - some of the greatest of all time. Unfortunately, this pressing is noisy. It’s not the pops and cracks so much as the inexplicable “rushing” sounds that are not present on the CD. At this price these should be premium quality, but for whatever reason, Rhino has disappointed. I did not buy The Fellowship of the Ring on vinyl so I don’t know how this compares.